One of the things I do when I'm not performing or writing is coaching architects on their presentation skills through Graceworks (www.GraceworksInc.com). We're about to share some of our concepts with kids at Abundant Waters (www.AbundantWatersKids.org). 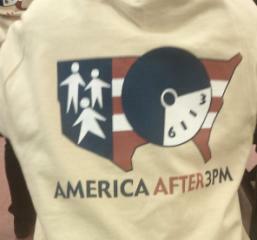 It's an after-school program which is hosting America After 3PM, a group that raises funds for after-school programs. They're sharing facts from a study they've sponsored. They found that there are 15.1 million kids with no place to go after school in the US. Abundant Waters is giving kids something fun and helping them to grow. One of their students gave one of the best speeches of the program, and she said Abundant Waters is her favorite part of the day. It's great to plug into what they're doing.